The blue light is the giveaway. You’re walking down High St in Prahran at 10pm and you notice a neon blue arrow pointing to (what looks like) a tiny cafe. You go inside. There’s an espresso machine, yep, and a few muffins in the counter cabinet. You’d never know you just stumbled into Melbourne’s new secret speakeasy bar. The clues are there, if you know where to look. Cryptic messages on the blackboard out front. The ‘Staff Only’ sign on the mirrored door behind the counter. The unmistakeable hum and buzz of a dozen people, reverbing through the back wall. Give the right signs to the lady behind the coffee machine and she’ll lead you into Promise Bar (either that or she’ll think you’re hitting on her—keep the signs platonic). Promise is unashamedly Prohibition-themed, which I kind of love. Part of you knows it’s a little kitschy, but mostly you’re just buzzing with a low-grade illicit thrill. No matter how many times we pulled on Fall From Grace’s bookshelf, or climb through the fridge into Jungle Boy, we still get that spine tingle. This is a secret. We’re not meant to know it’s here. The fit-out inside Promise is pretty classy. Dark metal, daubed in rust paint for a bit of texture. Well-polished timber bar, stained cherry dark. Skull motifs and ad-hoc designs from local illustrator The Darkness Lives (you can check out more of his work in the bathrooms, down back). It’s a cosy spot—capacity maybe 20-30, depending on the squeeze. And Vaughan says the word has been spreading, in an underground sort of way, since they opened a couple of months ago. It actually feels a bit weird to spruik a place like Promise publicly. It’s really something you need to discover on your own: late one night when the rain is misting on Chapel St, and you stumble in from the cold. That’s part of the mystery of the speakeasy, right? More mystery: there’s no formal drinks list at Promise. The cocktails are all bespoke. You sit yourself up at the bar and ask head barman Tim McCurdy to pick your poison: sweet, sultry, hard liquor or something softer. Vaughan says they’ll eventually have little cards for you to tick your preference. “We’re going to have little Pick your Promise cards,” he says. “You can tick ‘Play it Safe’ or ‘Be Adventurous’." There’s no food yet, per say, although the cafe up front is knocking together some top-notch toasted sangas. There’s a big kitchen out back, and the plan is eventually to offer a bar menu as well—that bit’s still a WIP. It doesn’t really matter anyway. 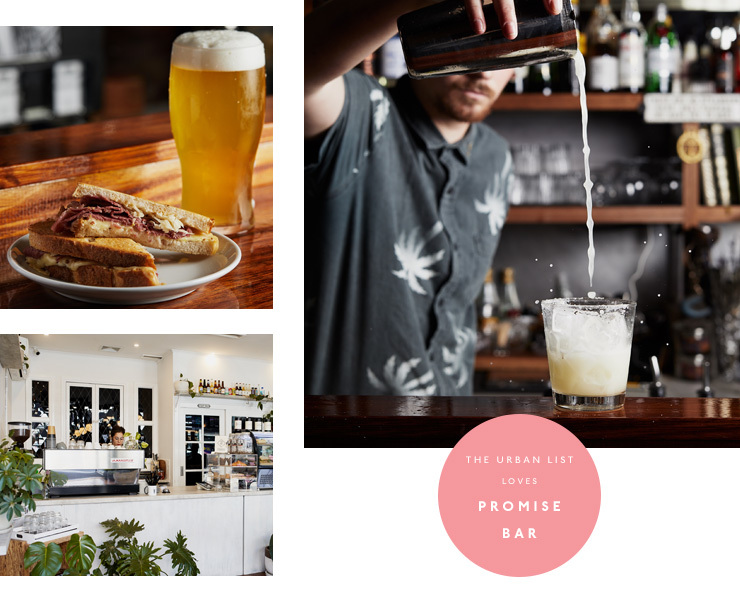 Promise is probably where you kick-on after dinner at Sash or Tokyo Tina or Hawker Hall. A warm little nook, jammed with boutique spirits and good tunes. Like any good speakeasy, when you leave there’s a slight feeling that you dreamed the whole thing. You look back along High St and all you see is the cafe, and the rain, and that buzzing blue neon. Want to learn more about Promise? Check out our Directory page.